Having just read about yarn bombing in Mollie Makes magazine I was very surprised to see this in Portugal. As we drove down the side of the Guadiana River, the Portuguese - Spanish boarder and looked at all the allotments that had flooded, due very high rainfall and the dams had to be released, loads of destruction all the way to the coast at Villa Real de St Antonio. 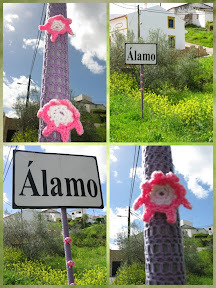 The small village of Alamo was set back from the river and their sign had been beautifully "Yarn Bombed".....lovely crochet, wouldn't it be nice if every village signpost was like this?